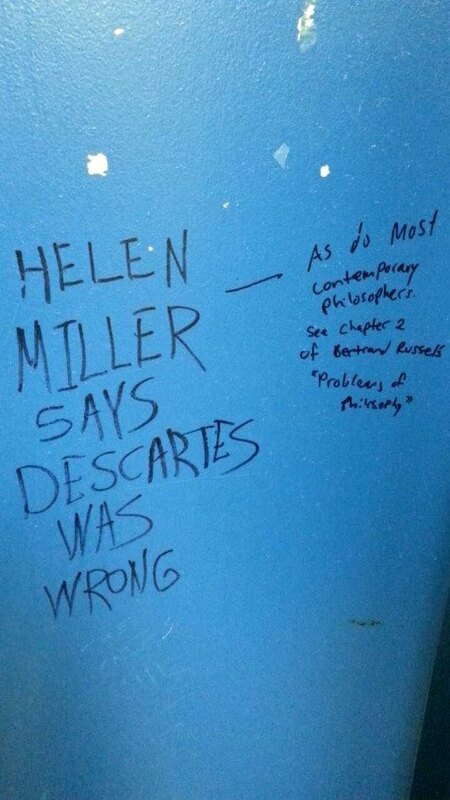 Photo "found inside a stall at a gas station in Virginia." Image Source: Facebook. "'I think, therefore I am,' he said (Cogito, ergo sum); and on the basis of this certainty he set to work to build up again the world of knowledge which his doubt had laid in ruins. By inventing the method of doubt, and by showing that subjective things are the most certain, Descartes performed a great service to philosophy, and one which makes him still useful to all students of the subject. But some care is needed in using Descartes' argument. 'I think, therefore I am' says rather more than is strictly certain. It might seem as though we were quite sure of being the same person to-day as we were yesterday, and this is no doubt true in some sense. But the real Self is as hard to arrive at as the real table, and does not seem to have that absolute, convincing certainty that belongs to particular experiences. When I look at my table and see a certain brown colour, what is quite certain at once is not 'I am seeing a brown colour', but rather, 'a brown colour is being seen'. This of course involves something (or somebody) which (or who) sees the brown colour; but it does not of itself involve that more or less permanent person whom we call 'I'. So far as immediate certainty goes, it might be that the something which sees the brown colour is quite momentary, and not the same as the something which has some different experience the next moment. Thus it is our particular thoughts and feelings that have primitive certainty. And this applies to dreams and hallucinations as well as to normal perceptions: when we dream or see a ghost, we certainly do have the sensations we think we have, but for various reasons it is held that no physical object corresponds to these sensations. Thus the certainty of our knowledge of our own experiences does not have to be limited in any way to allow for exceptional cases. Here, therefore, we have, for what it is worth, a solid basis from which to begin our pursuit of knowledge. The problem we have to consider is this: Granted that we are certain of our own sense-data, have we any reason for regarding them as signs of the existence of something else, which we can call the physical object?" Philosophical discussions on how to verify truth and reality have never been more relevant than they are now, with malleable truth dominating the Internet and a growing confusion about the distinction between virtual reality and everyday 'real' reality.